Originally launched in 1981 and then completely made over in 1997 and again in 2010, the Master from the French automobile manufacturer Renault is a spacious van, with dimensions that put it at the top of its category. 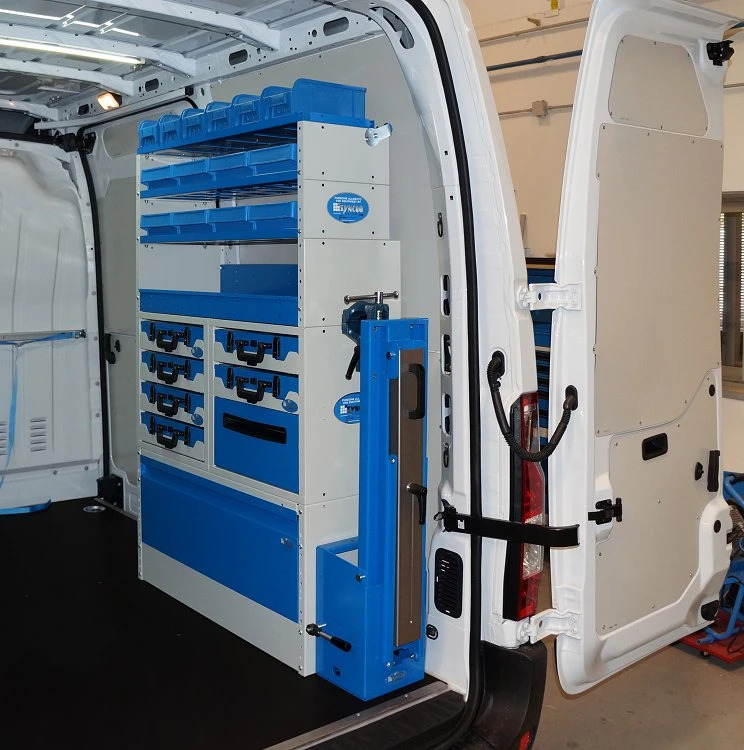 The cargo space is substantial, and straight clean lines make it ideal for loading and unloading goods, and for converting it into a mobile workshop with the help of modular Syncro components. 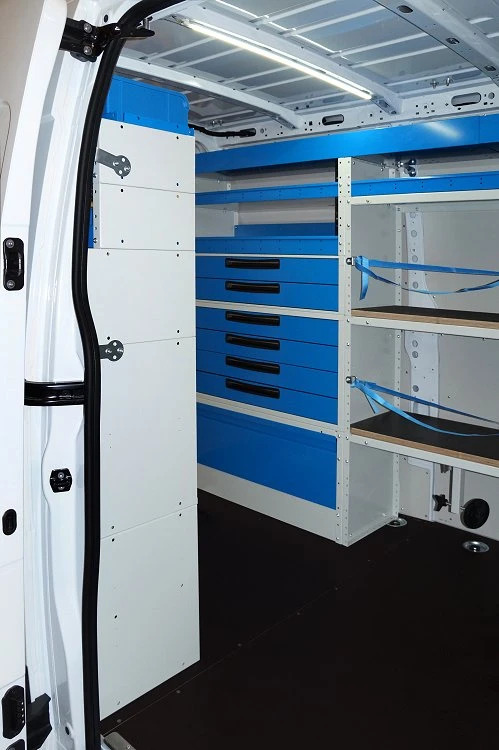 On this page, we see an example of an upfit done on the Renault Master L1 H2 with floor panel, interior paneling, shelving units installed on both sides, and accessories. 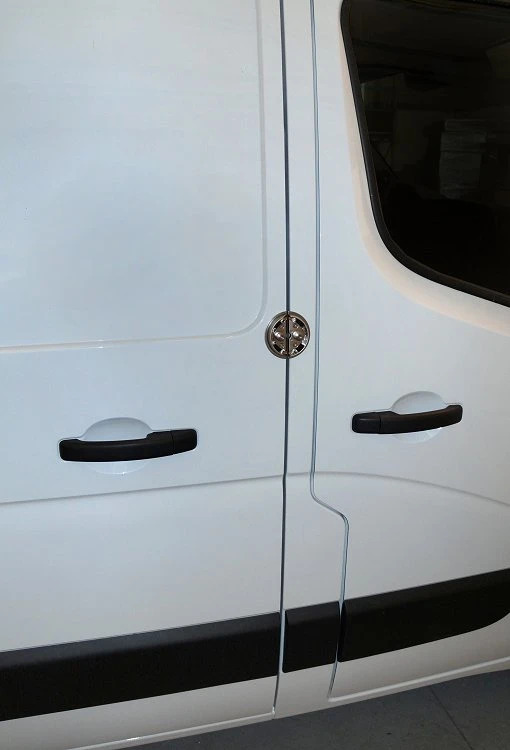 The first step in upfitting a van is the protection of the original floor and walls. A durable floor panel assures a flat sturdy loading surface, provides a solid base for mounting the racking units, and protects the metal floor from everyday wear and tear. As we see in most of our upfits, the owner opted for the 12 mm resin-coated plywood floor panel. The special 12 mm marine plywood, resin-coated panel was precision cut with CNC machinery and is completely waterproof, extremely durable, anti-mold, lightweight, and has a special non-slip surface. The walls have been protected by pre-coated galvanized steel protective paneling, which also covers the doors. These panels are also all laser cut, very durable and extremely effective, as well as being aesthetically pleasing. 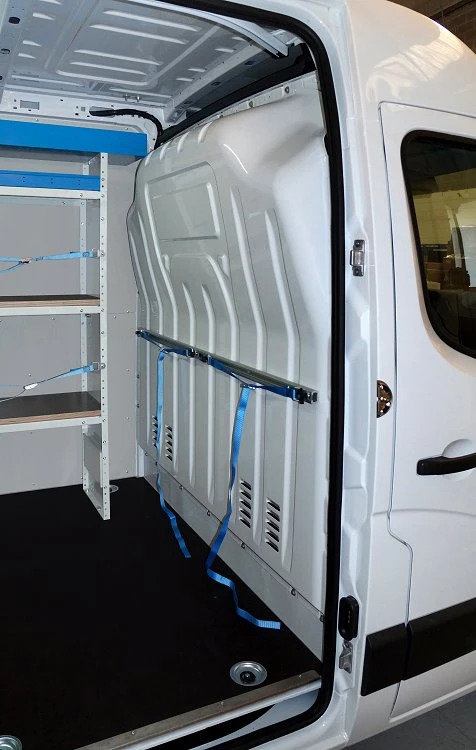 Taking a look at the racking units, you see that we installed a wheel arch frame with upward-opening front panel - creating extra convenient storage, as well as a solid base for the rest of the racking components. 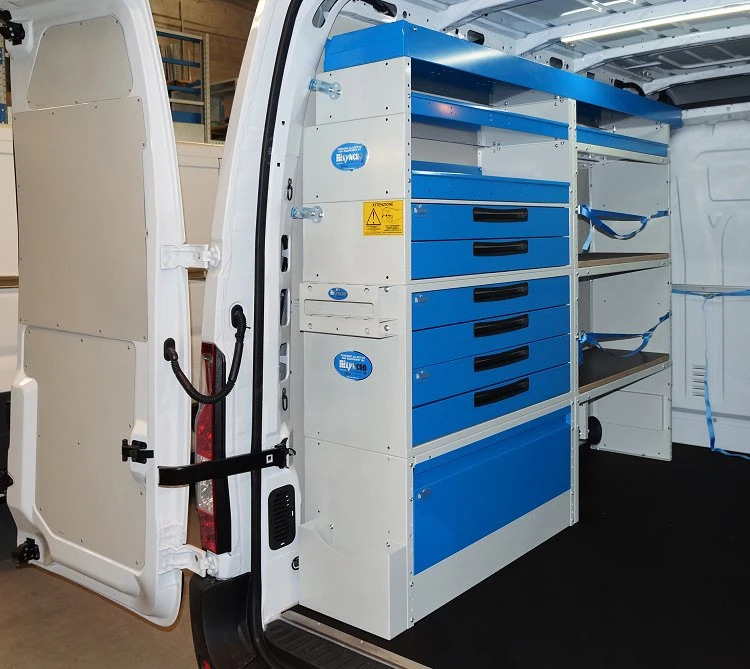 Above the base frame, we mounted two metal drawer units with a total of six drawers, complete with telescoping ball-bearing glides, automatic locking mechanism, recessed handles, interior aluminum dividers, and non-slip rubber mats. Above this, there are two shelves, also complete with dividers and rubber mats. Moving towards the bulkhead, the racking unit consists of three compartments for safe storage of cases. The lower compartment is equipped with the Syncro secure locking system, and the two above it have the Syncro strap and clasp system. Above these, there is another shelf with dividers and a rubber mat. At the top, we placed the Syncro extra-long storage shelf, with a locking end flap, ideal for transporting elongated objects such as tubes, pipes, bars, and rods. Along the base of the right-hand side racking unit is another wheel arch frame with the same upward-opening front panel, just like the one on the left. 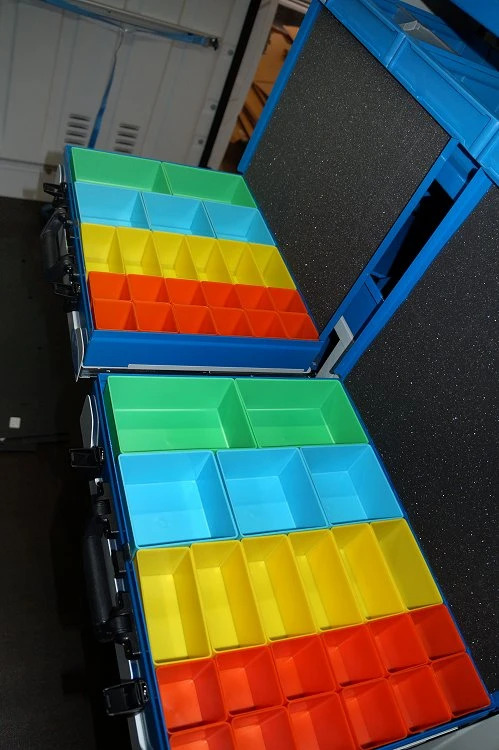 Above that are two drawer units with a large 200mm drawer (with double telescoping ball-bearing glides allowing up to 120 kilos) and six pull-out trays complete with the Syncro metal organizer cases, each equipped with plastic mix&match mini bins. Following the unit upward, we see a shelf with dividers, and two more metal shelves with removable and transportable polypropylene containers – each one with two dividers. At the top, we placed a final shelf with six more polypropylene containers. On the end panel of the right-hand side racking unit (with access from the back doors), Syncro technicians installed a folding workbench/vise mount with built-in vertical support and patented automatic opening system. On this, we mounted a 125 mm forged steel vise with a rotating base and built-in pipe jaws. 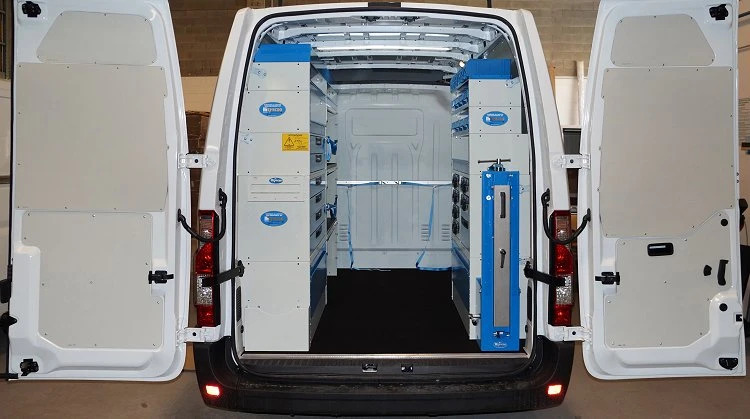 The Syncro System line includes a vast range of accessories designed to make work on your van easier, faster, safer and more pleasant. The cargo lighting consists of two thin, powerful, yet energy efficient 15 watt LED ceiling lights. Last but not certainly not least is the addition of a pair of UFO PLUS padlocks, made of high-strength stainless steel with a rounded ultra theft-resistant design.